With its new polygon geometry and other design innovations the versatile new Walter TC420 Supreme thread former gets up to 30% lower torque and a better surface finish than is normally gained with thread cutting. The new Walter TC420 Supreme Thread Former. 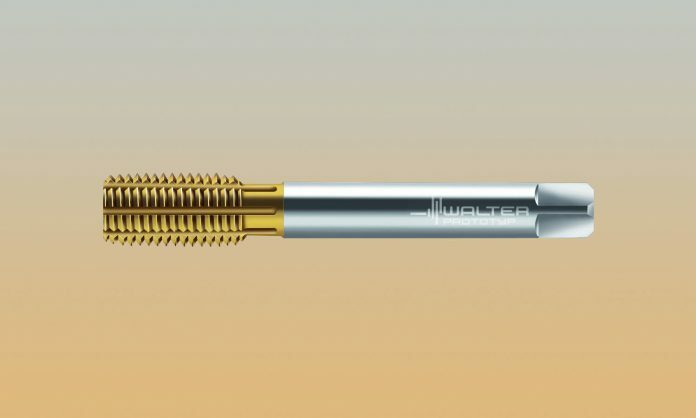 The new versatile high-performance TC420 Supreme thread former from Walter features a new substrate and a new polygon geometry that provides better forming behavior, less friction, and longer tool life. In addition, its polished surface yields a better surface finish than is achieved with thread cutting. This combination of features allows the new Walter TC420 Supreme thread former to reach higher tool life by producing up to 30% lower torque with higher cutting speeds. There are numerous variants in the TC420 Supreme product range, such as various coolant configurations, thread tolerance, chamfer forms and overall lengths. The new thread former can be used universally since it is ideally suited for most ISO material groups. Applications include 3.5 x DN with grooves/internal cooling, and 3.0 x DN without grooves/ internal coolant.